The global nanosatellite and microsatellite market are expected to witness highly competitive vendors landscape as new entrants are entering in the nanosatellite and microsatellite market, states Transparency Market Research (TMR) in its new report. As the nanosatellite and microsatellite market is potential, therefore the new entries in this market are rising significantly. Vendors in this market are heavy investing in research and development activities both by government and by private organizations. 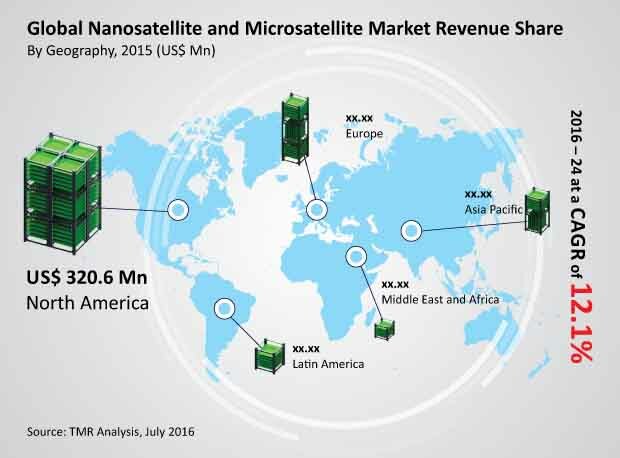 Moreover, vendors are making efforts by providing various services such as launch, manufacturing, and of data processing to maintain the competitive edge in the nanosatellite and microsatellite market. Some of the leading players in the global nanosatellite and microsatellite market are Lockheed Martin Corporation, Raytheon, Clyde Space, Inc., Planet Labs, Inc., RUAG Group, Innovative Solutions In Space (ISIS) Group, GomSpace, Sierra Nevada Corporation, Skybox Imaging, Inc., and SpaceQuest Ltd.
As per the analysis done by the author of the report, the global nanosatellite and microsatellite market is projected to reach a valuation of US$ 2.2 bn by the end of 2024. The during the forecast period from 2016 to 2024 the market is expected to expand at a CAGR of 12.1%. Under the application category navigation and mapping segment is projected to lead the market during the forecast tenure. The significance of this segment is highly related in military and defense, scientific research, and various other. Regional growth is estimated to boost in Asia Pacific in the coming years. In North America is leading the global market, wherein the U.S. is extremely creative in using nanosatellite and microsatellite and with entrance of new vendor sin the market. The significance of nanosatellite and microsatellite is seen in areas of communication, power, navigation and mapping, scientific research, reconnaissance, and various other including biological experiments, Earth observation, and remote sensing. The use of nanosatellite and microsatellite is used by defense organizations to make communication signals to soldiers stationed in distant locations and far-fetched places. Companies in telecom sector are also using nanosatellite and microsatellite to provide faster internet services and bandwidth for their users. Furthermore, technological advancements in nanosatellite and microsatellite have also reduced the cost of launch. Now the satellites have become more advanced than conventional satellites that can be used to serve various needs for accessing space missions by numerous countries. On the other hand, few restraints may hamper the growth of the nanosatellite and microsatellite market in coming years. Due to strict rules and regulations imposed by the International Telecommunication Union (ITU), may restrict the growth of the market in coming years. ITU is an organization that regulates radio frequencies and orbital slots for information and communication technologies. However, improving technological advancement and increasing number of participants in the nanosatellite and microsatellite market may boost the global demand for the market. Moreover, increasing use of communication through smart devices in the global population has also uplifted the need for technically advanced nanosatellite and microsatellite that will support the market to grow in coming years.